Available across PlayStation 4, PS Vita, and PC. Atelier Firis: the Alchemist and the Mysterious Journey will launch physically and digitally for PlayStation 4, digitally for PS Vita, and for PC via Steam on March 7 in North America and March 10 in Europe, Koei Tecmo announced. A new set of screenshots introduces key companions Sophie, Plachta, Oskar and Drossel, all of whom are returning from Atelier Sophie: The Alchemist of the Mysterious Book, as well as newcomer Revy. 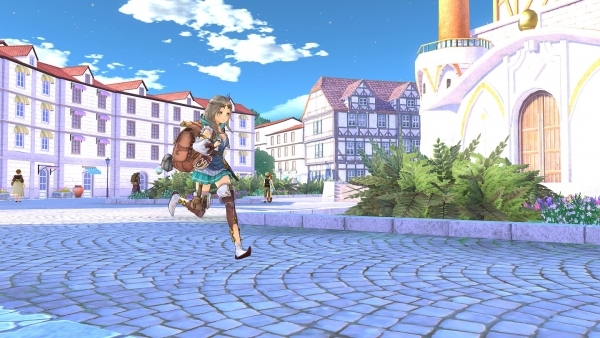 A vast world awaits in Atelier Firis: The Alchemist and the Mysterious Journey, with views ranging from busy harbors to murmuring rivers, to imposing mountains, and more. Along Firis’s heartwarming adventure, she will visit a wide variety of picturesque towns and villages such as Reisenberg, the prosperous city where travelers gather, Mechen, a tranquil village with fields as far as the eye can see, and Flocke, the village of dancing snow. Between settlements there are a plethora of different environments to discover, each with their own particular weather conditions that affect travel. Selecting the appropriate attire for each situation will grant Firis benefits and allow her to easily traverse these terrains. The Snow Bright costume reduces the consumption of Life Points in icy cold conditions, while the Zealous Explorer gear aids travel through blistering heat. Outfits can have countless other effects such as accelerating movement speed, enhancing synthesis abilities or increasing the likelihood of finding high quality materials! While exploring their surroundings, players will encounter events which they must overcome to access new locations. These challenges will have multiple solutions that can permanently alter the environment. Take a broken bridge, for example – fixing the bridge will allow for easy access to the other side, but taking an alternate route could lead to the discovery of useful synthesis materials. Some of these Landmarks will be quite useful for Firis’s travels and she will need to return to them often! Once visited, Landmarks can be used as Fast Travel locations, allowing Firis to easily travel back and forth across the world.